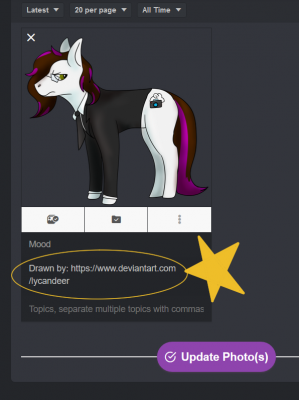 How to credit art » Canterlot Avenue | The Roleplay & Social Site! 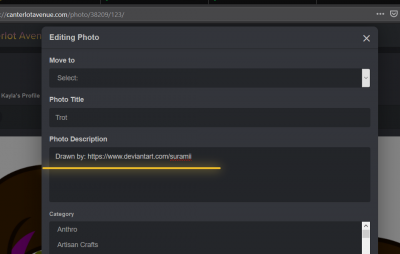 This is an easy step by step tutorial to show how to credit artist in the description of your photo. Then copy and paste the original artist name in the description, and update your photos! But, what If you already uploaded the picture? 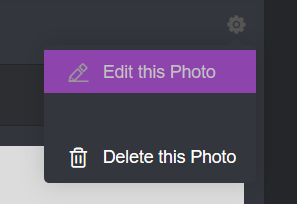 Go to the photo you uploaded, and click the little gear at the top right. As always, I am very happy to help find original images and help you give proper credit, or find out if you can repost. Acry Weaver, Bright Brave and 6 others liked this. Kayla is at it again, being a credit to the staff team! i'm all for crediting artists....but if they don't have it LEGALLY copyrighted then by posting it online = fair use, and asking for more then credit is very much not within your right, UNLESS you have a copyright on it. this is done so that a company can not copyright strike/claim something referenc...View Morei'm all for crediting artists....but if they don't have it LEGALLY copyrighted then by posting it online = fair use, and asking for more then credit is very much not within your right, UNLESS you have a copyright on it. this is done so that a company can not copyright strike/claim something referencing something they made. like if i wanted to make a video/post about how people should join canterlot. any art featured in it even if by accident((only applies to videos)) should be deeply researched even if it's just pfps / the site icon ((as some artist had to make the site icon)) now i'm not saying to forget about crediting. what i am saying is telling people to get permission for the art is still absurd to me, even after i got better at drawing with a pc. unless they have the legal papers saying no one can use it without their permission then i don't need permission to credit them and shared something i like with my friends. ik my opinion on this is seen in a negative light, but i'm like what harm happens when new people see your art for the first time from someone crediting you with an example of why thy thing you are a good artist? It's completely the artist's view and opinion. Just please respect that. Many artists do not like having their art on websites they do not have profiles on, or have immediate access to, it's different for everyone. dally are you going by the united states description of fair use or some websites description of it. as i am based in the us so the only laws that apply to me is laws in the us. so long as i am not in international waters/ on international land. You actually brought up a good point! I deleted my original post after a quick review, but since you responded to it anyway I'll offer a reply; I was actually using the US's definition of fair use, as posted on https://www.copyright.gov/fair-use/more-info.html Howeeever, I remembered quickly after ...View MoreYou actually brought up a good point! 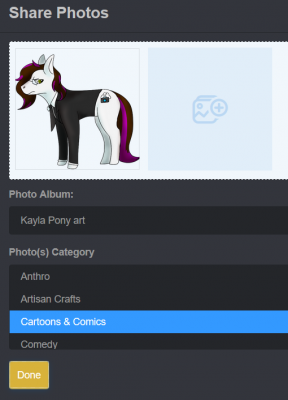 I deleted my original post after a quick review, but since you responded to it anyway I'll offer a reply; I was actually using the US's definition of fair use, as posted on https://www.copyright.gov/fair-use/more-info.html Howeeever, I remembered quickly after that Poniverse (and thus Canterlot Avenue) abides by Canadian law, not US law. I feel bad, I should know these things as both a moderator and Justice Administration student. ;w; It's a learning experience for all of us, woo!